On October 6, 1993, Jordan announced his retirement, citing a loss of desire to play the game. Jordan later stated that the murder of his father earlier in the year also shaped his decision. Jordan’s father was murdered on July 23, 1993, at a highway rest area in Lumberton, North Carolina, by two teenagers, Daniel Green and Larry Martin Demery. The assailants were traced from calls they made on James Jordan’s cellular phone, caught, convicted, and sentenced to life in prison. Jordan was close to his father; as a child he had imitated his father’s proclivity to stick out his tongue while absorbed in work. He later adopted it as his own signature, displaying it each time he drove to the basket. In 1996, he founded a Chicago area Boys & Girls Club and dedicated it to his father. Jordan then further surprised the sports world by signing a minor league baseball contract with the Chicago White Sox on February 7, 1994. He reported to spring training in Sarasota, Florida, and was assigned to the team’s minor league system on March 31, 1994. Jordan has stated this decision was made to pursue the dream of his late father, who had always envisioned his son as a Major League Baseball player. The White Sox were another team owned by Bulls owner Jerry Reinsdorf, who continued to honor Jordan’s basketball contract during the years he played baseball. 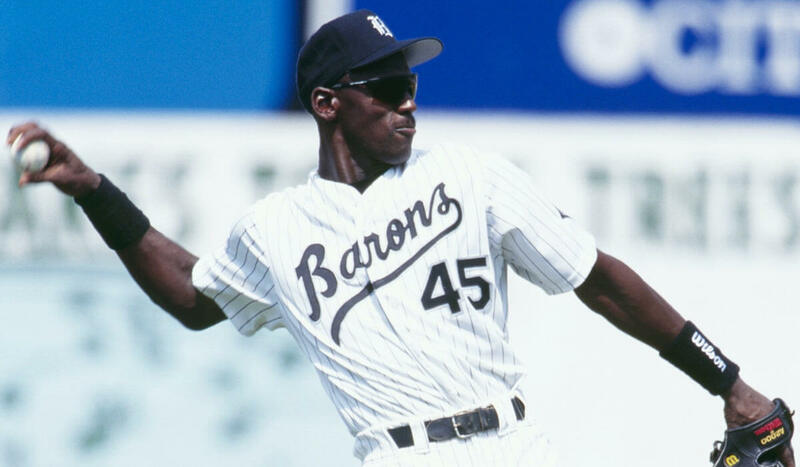 In 1994, Jordan played for the Birmingham Barons, a Double-A minor league affiliate of the Chicago White Sox, batting .202 with three home runs, 51 runs batted in, 30 stolen bases, 114 strikeouts, 51 base on balls, and 11 errors. He also appeared for the Scottsdale Scorpions in the 1994 Arizona Fall League, batting .252 against the top prospects in baseball. On November 1, 1994, his number 23 was retired by the Bulls in a ceremony that included the erection of a permanent sculpture known as The Spirit outside the new United Center.